Is there an uglier male fashion than a smart suit worn with an unbuttoned shirt and no tie? Almost invariably displayed on television nowadays by politicians and newscasters attempting to look "cool and with it", the actual result is that we are obliged to stare at several inches of pallid neck, bobbing Adam's apple and sparsely haired chest - thus distracting us from the seriousness of the news story. It's noticeable that this style of undress has largely become the habit of middle aged men (John Prescott is now doing it - heaven help us!). It can't be long, therefore, before style-conscious younger men switch to something more becoming than a smart suit and an unbuttoned shirt. May I suggest two alternatives to this scruffy fashion? Try the Nehru Jacket which was very popular in the 70's this style of jacket is actually based on the Indian sherwani apparently (see Wikipedia. It's smart, attractive and colourful, not to mention the fact that the high collar covers up those nasty double chins and unattractive wobbly throats perfectly! Alternatively, how about the exquisitely-tied cravats worn by those 18th-Century dandies? At any rate though, lets loose the scruffy unbuttoned shirt thing and let's bring tasteful good looks back to our television screens! How many men on here leave their top-button undone when wearing a tie in the office? Using my tie to hold my strides up of late. I am in a bit of a quandery as to what knot to use, a mincing bowline seems to work well in the office. Tie Right, do you still check in? How are you faring in this hot weather? Hope you are going to work with a looser tie. Indeed. I was feeling the heat a bit today but kept the tie high while in the office, as it is what I'm used to. I did keep the top button undone this morning, but after lunch needed to do it up. 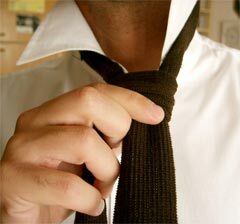 I pulled my tie down and undid the collar on the way home. The temptation to loosen off may be greater tomorrow if it's still warm, but the office dress-code was still very smart today. So do you have any tips on going 'obviously' looser with the tie in an office where pristine is the norm? And have you loosened off more today - if so how loose? Site hacked, Tie Right, shame really. Jealousy abounds. Tie Right I have bought one of those ties with the Windsor knot attached to a length of knicker elastic. In the summer I tie a weight to my tie, then I remove it or put it back as the case may be. Different weights different knot level its really cool. I also painted a button on my adams apple so even if my tie is untied it still looks tied. How Loose - I nudged my tie down a tad more on the way in and out of work, so it is just obvious the top button is undone. Definitely cooler but just about smart enough. In the office I've tried to just pull the tie up a bit more so I still look smart. On occasions I've done up my top button for meetings with the boss as the undone collar seems to be against the office dresscode - plenty of tight ties and collars even with the hints of summer. If the mercury rises much more I'll possibly try to have the tie a touch looser in the office. How about you? Do you loosen off more - and how far - in the warmer weather? Any tips on going 'obviously' looser with the tie in a place where pristine is the norm? Its as well I have had my chest & armpits waxed, it would be horrendous if ones body hair got caught in the blades because it spins at a merry rate of knots. Yeah, right. Hmm.. bow-tie? Nope, not you! I have invested in a spinning bow-tie from Whiskers Animal Benevolent League, It keeps me cool on the train. So, what's the plan travelling to/from work - at work - in the evenings?